It's another Marriage Monday! You can see my previous Marriage Monday posts here. To join Marriage Monday, go here! A couple of the blogs I read regularly talked about empathy and understanding today. (Maybe that was a sign to me? Hmmmm......) In marriage, understanding our spouse is especially important. If we don't have understanding, it's very difficult to get along with one another. And I think it's pretty important to get along if you're going to be married! I think empathy and understanding are things you have to consciously work on. Often when I tell my husband a problem, he is quick to provide a response of what he would do to fix it. This can be frustrating because it's not always what I would (or should) do and sometimes I just want him to listen! On the flip side of that, when he is telling me a problem or issue, I want to hear every little detail and analyze it. I KNOW he finds this frustrating. But I think that is a major difference between men and women - men want to fix the problem and move on, or just move on. And I think women are more prone to dwell on things and to want to know the ins and outs of the problem. Relationships are tough. It was that way since the beginning of time, and the same is still true now. One of the reasons is that we are all different. When we hear someone telling us something difficult they are going through, we usually think, "Well, I would do this, and things would be fine," but we aren't the other person. It happens a lot with disagreements, too. We think to ourselves, "I would never do that to someone else." True, you wouldn't but they might. Practice empathy. Do your best to set aside the instant platitude, listen and be empathetic. The world is full of people going through difficult times, and if you take some times to start to practice empathy, you could have the opportunity to release the pain of one person, and that could have a positive ripple effect. That's just an excerpt of his post (click the link above to go read the full thing) but he is right! When we have an argument (disagreement, heated discussion, whatever you want to call it!) with our spouse, it's good to stop and try to think about their opinion or feelings. We need to put aside our selfishness and pride. If we're more considerate of them, they're bound to be more empathetic with us when we need it. 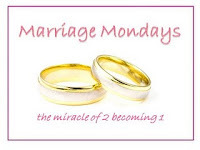 Thanks so much for linking up today to Marriage Mondays. This is such an important quality of love to remember, and I think when I'm understanding of my husband's feelings, he is more likely to be understanding of me. Always a challenge to think of each other's feelings more than our own. So glad you shared!